In early December the figs and finger limes are finished, the oranges and mandarinquats just starting, and the apples are in their glory! We are down to four apples still on the trees - and these are the late gems. Yellow Newtown Pippin still hasn't reached it's prime, which usually happens after first frost. 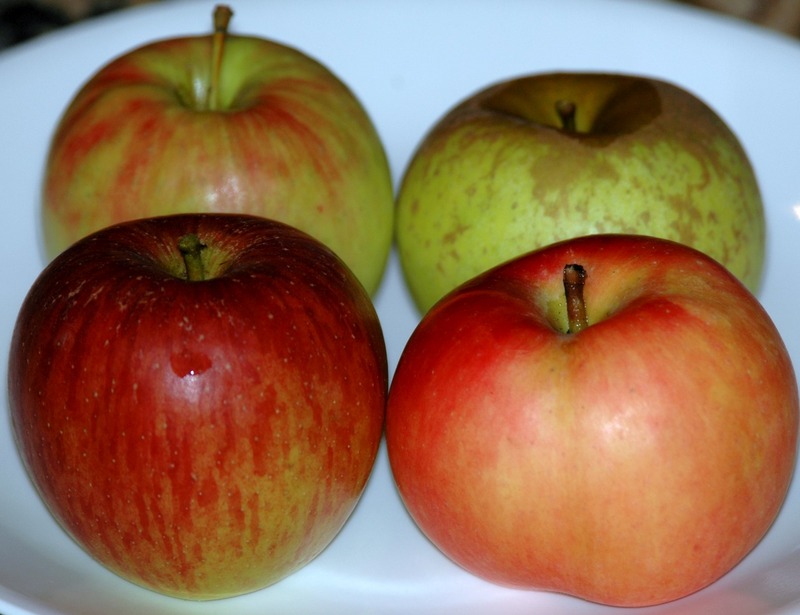 From front right clockwise: McIntosh, Braeburn, Cripp's Pink, Yellow Newtown Pippin. McIntosh - this is our son's favorite. When I give him a choice of these four, he takes the McIntosh and tells me "you can have one of these [meaning any except the McIntosh he by now has bitten]". At this time of year these are tender (not mealy!) apples with amazing aromatics - these are richly fragrant, sweet apples, with deep flavor. This is the National Apple of Canada. For us, this is the fourth heaviest bearing apple tree in the yard. This month is the end of the harvest, they don't always last into December. Braeburn - this is my favorite of the four. It is a firm apple with a sweet-tart apple flavor. This is the apple tree I planted outside the house back door (alongside Montmorency cherry), so I can have a snack without having to battle the autumn storms! It bears fairly heavily, our third heaviest and a very reliable one. These can hold on tree to the end of the month, generally, though gather them once frost falls. Cripps Pink - this is in the market as "Pink Lady", though I prefer the older name. The apples are just now coming into their full flavor and sweetness - these are good. The tree bears heavily and the apples have been tasty since late August. Yellow Newton Pippin - these are astounding! Unlike most US market apples, these have a light russett - the skin is rough in patches. These are firm, sweet-tart, flavorful, and the last apples on our trees generally - we've picked these at their prime still as late as January (if we haven't eaten them all first...). This is our heaviest bearing and most reliably bearing tree.